WE ARE ON THE FINAL WEEK FOR OUR DGX GIVEAWAY! 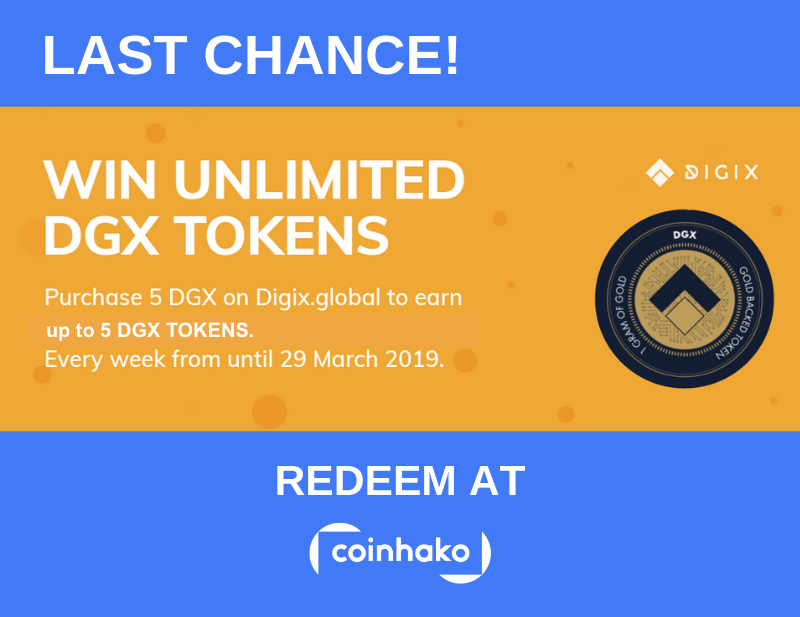 ↑↑↑ CLICK THE PICTURE to BUY DGX NOW! Prize only redeemable through Coinhako wallet. Tune in every Friday at: instagram.com/digix.global/ to know if are a winner. There is NO LIMIT to the number of chances you can win. Winner (s) will be announced every Friday & decision on participants, winners and prizes are final and non-negotiable. Chances earned will reset at 12pm (SGT) every Friday & only apply to the nearest Friday announcement. All purchases must be made through the Digix Marketplace, DGX obtained through any other means will not qualify. ← Coinhako Rewards: It pays to start blockchain the right way!